Surround Air Ionic Tower Air MULTI-TECH Intelli-Pro INTELLIGENT AIR PURIFIER 6-Stage XJ-3800A Air Purifier Tower. This is the model XJ-3800A and it retails for $325. This unit comes with a 3-Year Warranty and our 100% Money Back Guarantee. This is the Most Complete Air Purifier on the Market. Odor, dust and allergen sensors let you know when certain pollutants are detected, such as cigarette smoke, chemicals, dust mites, pollen, pet dander, mold spores and many more. The clean air monitor tells you how clean or polluted the air is. If you select "Automatic" mode, the Intelli-Pro will automatically adjust the settings accordingly, reducing electricity usage if the air is fairly clean. Diagnostic sensors indicate when to replace filters, and when to clean the metal dust collector grid. The UV light and negative ion indicators let you know that these functions are working, and indicate when the UV lamp needs to be replaced. - Electrostatically-charged dust collection grid traps particles & pollutants like a magnet. Simply wipe clean when dirty. 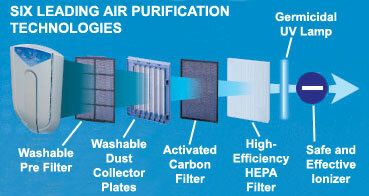 - Long-lasting, high-efficiency HEPA filter - most effective way to capture dust and allergens. - Activated carbon filter traps chemicals, gases and odors. - Germicidal UV lamp destroys micro-organisms. - Air-cleaning negative ions are circulated throughout the room. Completely safe (virtually no ozone), and scientifically proven to be effective and to enhance filter efficiency. - The washable pre filter does not require replacement, and enhances the durability and performance of the other filters. - Washable Pre Filter: The air first enters pre filter, capturing the largest particles, which enhances the durability and performance of the other filters. - Washable Dust Collector Plates: The electrostatically-charged dust collector grid traps particles and pollutants like a magnet. 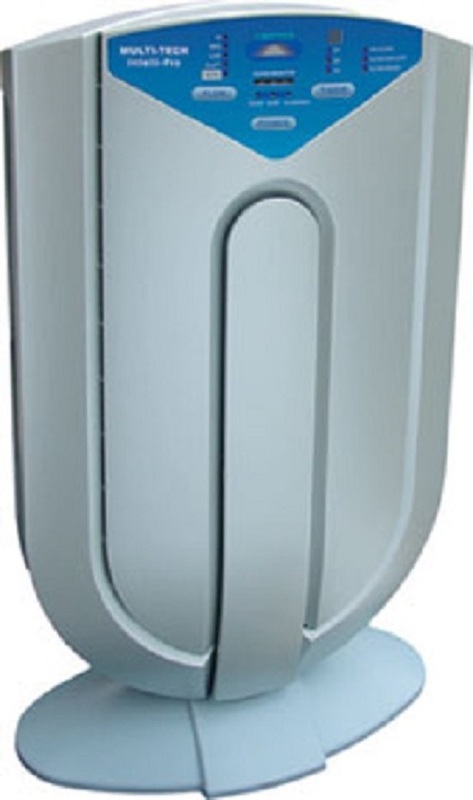 This is similar to Friedrich C-90A, which is Consumer Reports' top-rated air purifier. Unlike the C-90A, the Intelli-Pro has multiple other leading technologies. - Activated Carbon Filter: The best type of air filter for trapping chemicals, gases, odors and cigarette smoke. According to Penn State Dept. of Aerobiological researchers, carbon filters serve to remove odors, volatile organic compounds (VOCs) and chemicals that other filters cannot. - High-Efficiency HEPA Filter: The most effective type of air filter at capturing dust, allergens and other solid particles (including bacteria). HEPA filters are recommended by the U.S. Department of Homeland Security. - Germicidal UV Lamp: The most effective way to destroy micro-organisms, such as germs, viruses, fungi (such as mold) and bacteria. Also destroys micro-organisms including those that are trapped by the HEPA air filter, preventing them from reproducing and recirculating through the room. UV lamps are recommended by the U.S. Centers of Disease Control. - Safe and Effective Ionizer: Circulates trillions of negative ions to neutralize floating pollutants throughout the room. A Journal of Hygiene study found negative ions to improve efficiency of filter units, and multiple studies (including those by the U.S. Dept. of Agriculture) have found ionizers to be highly effective against dust, bacteria, etc. Finally, the Intelli-Pro's ionizer is proven to be safe, producing virtually no ozone whatsoever. The Multiple Air Inlet Design enables maximum air flow through the unit. The powerful, yet quiet fan accelerates the purified air throughout the room. Economical. The Intelli-Pro is energy efficient, and uses sensor technology to reduce electricity usage. Offers low-cost replacement filter and UV lamp. Quiet. Features "Quiet" setting to maintain peace and tranquility in room. Still fairly quiet even on "High" setting though. - Applicable Area: Up to 650 sq. ft.